His Eminence, the Most Reverend Metropolitan George (Khodr) of the Byblos and Botris (Mount Lebanon) is the metropolitan of the archdiocese of Byblos and Botris (Mount Lebanon) of the Church of Antioch. He was one of those who inspired the renewal of Orthodox Church in Lebanon and Syria during the latter half of the twentieth century. George Khodr was born in Tripoli, Lebanon on July 6, 1923. He grew up in the Christian neighborhood of Harat El Nasarah in Lebanon’s second city, Tripoli. He attended St. Joseph University, a Jesuit institution, in Beirut, studying law in preparation of entering a diplomatic career. He graduated in 1944 with a license in law. On March 16, 1942, George Khodr joined with fifteen students from the faculties of Law and Medicine in founding the Orthodox Youth Movement (known as MJO - mouvement de la jeunesse orthodoxe). This renewal movement became visible in a number of venues: the rebirth of monasticism, foundation of Bible study groups, witnessing among the working people, invigorating parish life, opening Christian hostels, and other religious and social activities. He participated in a non-violent demonstration on November 11, 1943, against the French colonial government that was attempting to stifle the quest of the Lebanese people for independence. This demonstration ended in the government personnel firing upon the unarmed demonstrators, killing eleven. In the early 1950s, George studied at the St. Sergius Orthodox Theological Institute in Paris, graduating with a diploma in 1952, and then returned to Lebanon. On December 19, 1954 he was ordained a priest and was assigned to the parish of the Port of Tripoli in 1955. During these year Fr. George was active as a theologian, pastor, and spiritual father. His reputation traveled beyond his diocese and established him as a theologian of note. In 1968, he was honored with doctorate honoris causa from the St. Vladimir's Orthodox Seminary in New York and in 1988 from the Faculty of Protestant Theology of Paris. Fr. George remained at the Port of Tripoli parish until he was elected to the episcopate on February 15, 1970. In addition to his duties within his diocese, Metr. George has been involved deeply in the education field, working as a professor of Arab Culture in the Lebanese University and of pastoral theology in St. John of Damascus Institute of Theology of the University of Balamand. Metr. 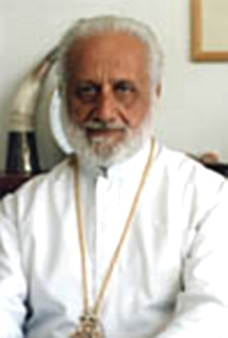 George has been active in the ecumenical movement and in dialogue with Islam, as well as representing the Church of Antioch in pan-Orthodox and ecumenical meetings. Metr. George has been a prolific writer with many articles, sermons, and books to his credit. This page was last edited on February 27, 2012, at 21:02.